Our services and prices are based on the exclusive charter of our "paraw sailboat"
Eclusive means: Only you will be on board. Noone else plus the crew. 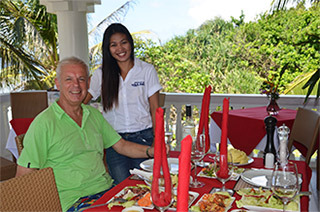 There will be very fine cuisine in a first class restaurant on Carabao Island. Fresh foods will be cooked just for you. If you like, you can order it even a day before. Of course eclusivity causes a bit higher expenses. So the prices can not be at all compared to mass tourism by motorboats, carrying 25 guests and more. We do have a crew of well trained sailors who have lots of experience to sail a Paraw since many years. Our boat is nearly twice the sice of the average paraw. As opposed to other boats, we do have an inboard engine. One of our sailors will be your tour guide. You will be picked up at a meeting point near the beach and have personal service for the entire time of your trip. Tour guide. 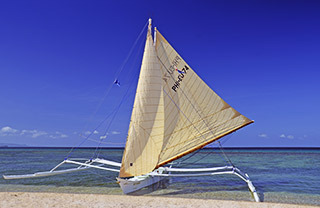 If you want to get away from crowded Boracay and have a quiet and relaxed day, island hopping under sails, our „Misty Morning“ sailboat, is the way to go. And also Carabao Island is a very quiet and peaceful place with good possibilitys for hiking, snorkeling, great lunch or just hang out on the beach. The prices depend on: How many people want to sail, what exatly you want to do. There is a choice: Exclusive and premium island hopping or Island hopping light. How to find out? 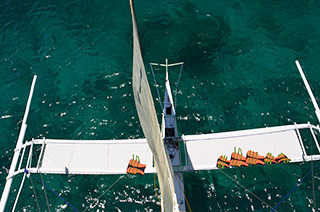 Just click following link, chose your sailing activity and let us know. We will answer soon as possible. Click here.